The NXF and GCN have appointed Lisa Connell to lead the business into the next chapter of its story. News 22 March, 2019 . Written by Peter Dunne . 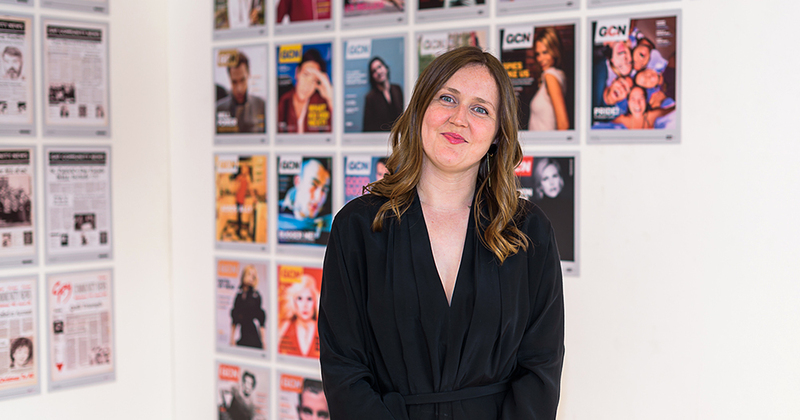 Lisa Connell has been appointed to the position of Managing Editor of GCN. A valued member of the team for over a decade, Lisa’s work with GCN and her tireless LGBT+ activism on behalf of, and constant support for, the community has proven there is no one more suited to the role of Managing Editor to lead the business into the next chapter of its story and its continued service to the visibility and representation of LGBT+ lives. In 2019, it is clear that GCN is so much more than a magazine, with a busy daily news site allowing for an ever-growing online presence, an increase in hosting live eventsincluding community talks, exhibits and some (pretty epic) social gatherings, alongside our commitment to supporting our LGBT+ family both nationally and across the globe. Lisa is a core member of the team behind Mother and leads the charge on Mother’s cultural impact, particularly with bigger gigs like the annual Mother Pride Block Party, alongside her voluntary work with Dublin Pride as a current Director of the company. The new era for the title is an exciting one. As we commemorate 40 years of the NXF, our work in the pursuit of equality and openness is as important as ever. Much work remains to be done to combat the rise of a right wing rhetoric espousing hatred and fear, and GCN continues to be a vital voice and a platform for LGBT+ people in Ireland and abroad. Our community is so fortunate to have a strong committed team in GCN Towers, who strive to inform, educate and entertain us – thank you to Lisa, Peter, Stefano, Katie and Dave, and we look forward to all the excitement planned for 2019! Lisa Connell’s appointment as managing editor of GCN has been an awfully long time coming. As the magazine’s former commercial manager she has an enviable track record with advertisers and the business community. Allied to a keen editorial eye and unflappable work etiquette, Lisa is perfectly placed to take GCN to even greater heights (if that was possible). I hugely admire everything she has done for the magazine and am particularly grateful that we collaborated on the GCN 30th anniversary exhibition, Proof, at Dublin’s Gallery of Photography. Connell deserves huge credit for project managing what was an enormously complex event. I wish her all the best in her new endeavour. GCN is a brilliant and vital resource for us all. I know it is a big challenge to take over as Managing Editor and I want to wish Lisa the warmest of good luck running GCN. I know she can do it with verve and style. I’m so honoured to be appointed Managing Editor of GCN. Having spent the past decade working to sustain the magazine financially and serving our fabulous Irish LGBT+ community I relish the wonderful opportunity to lead a most fantastic team of people into the next iteration of our vital community resource. I believe strongly in the power of collaboration. It’s what makes GCN as special as it is. I’m also acutely aware of our role as a member of the global LGBT+ family and our duty of care to LGBT+ folk in Ireland and beyond to represent and give voice to each person’s story that must be heard. The magazine would be nothing without the wonderful community it represents. My interest and passion for working in LGBT+ publishing are driven by my long-standing roots and relationships in our LGBT+ community through many years of LGBT+ and feminist activism. 22 March, 2019 . Written by Peter Dunne .